12. Italian border stitch with herringbone and Cretan stitches in these rows. 13. basque and Pekinese stitches are worked with Italian border stitches . The knots are extended and oyster stitches are worked in the corners to make this second motif. 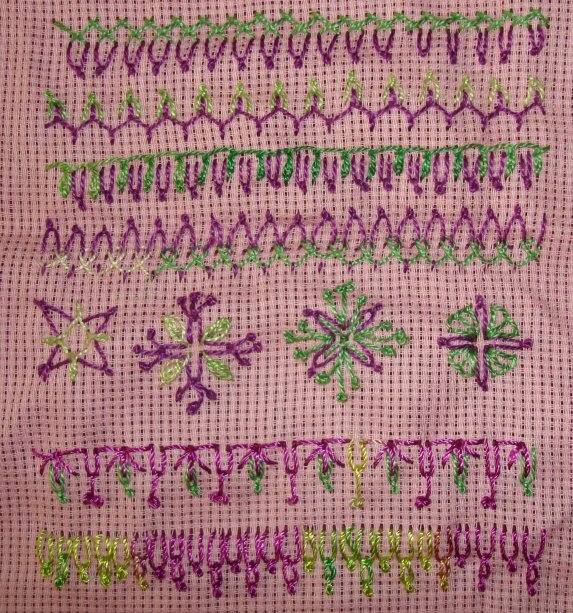 Straight stitch and pistil stitches are combined in the third motif. Buttonhole wheel variation is part of the fourth motif. 15. 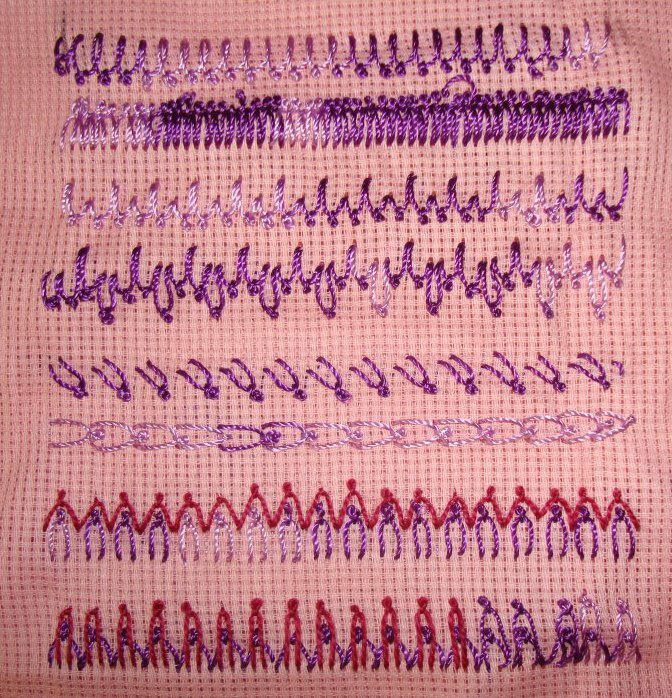 Algerian eye stitch variation and extended knot Italian border stitch are combined in the first row. Detached chain stitches are worked over alternate Italian border stitches and the knots are worked after that in the last row. 8. detached chain stitches are worked with Italian border stitches in the first row. Staright stitches are worked on either side of the Italian border stitch to form the sheaf bundles in the second row. 9. Italian border stitches are combined with buttonhole stitches in these two rows. 10. I tried weaving and then whipping these stitch rows in this section of the sampler. 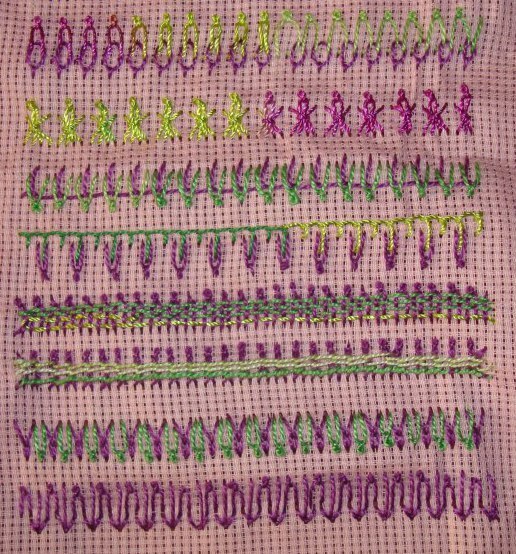 11. first row is a combination with wheatear stitch and the second row is done with fly stitch. This stitch experiments are getting interesting. I did a few more rows of this stitch on this sampler. 5. The Italian border stitch lines are worked together in these rows. 6. The first row, this stitch is worked at an angle . Two lines of diagonally worked Italian border stitches form the second row. 7. Two Italian border stitches at right angles worked as steps, is the first row. Instead of working this stitch straight, I tried twisting it in the second row. I like this variation. This week’s stitch of the TAST2012 challenge by SharonB is Italian border stitch. I had worked a few samples of this stitch during the previous TAST challenge. This time around, I wanted to work this stitch combining it with other stitches. Initially I am starting with some variations of this stitch, which were not worked before. 1. In the first row, the stitch is worked at an angle, which is not distinctly clear, because of the twisting of the thread. In the second row, the starting point of the second stitch is the midpoint of the first stitch, makes this line more compact. 2. the basic stitch is worked at different lengths, and this is alternated and repeated throughout the first row. 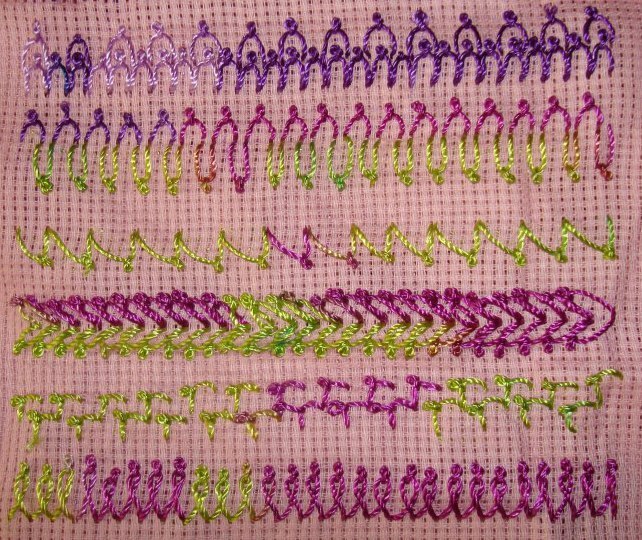 The varying length of the stitches are worked to form a pattern in the second row. 3.The stitches are worked diagonally in the first row, and they are worked horizontally in the second row. 4. two lines of Italian border stitch are worked together in two ways in these rows.